Section five contains 13 photos including the descriptive photo. The definitions for all the terminology used below are available in Background and Discussion of black and white films – 8 x 10 (section two). Reading section two prior to section five is suggested. 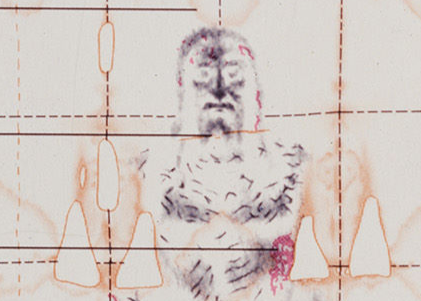 Vernon took high quality 8 x 10 Ektachrome transparencies of the Shroud using the technique of photographing three separate parts of the Shroud. The three parts included: Frontal-Dorsal Torso upper, Frontal Torso lower, Dorsal Torso lower (middle: the front and back of the head, one end: front lower legs, other end: back lower legs). 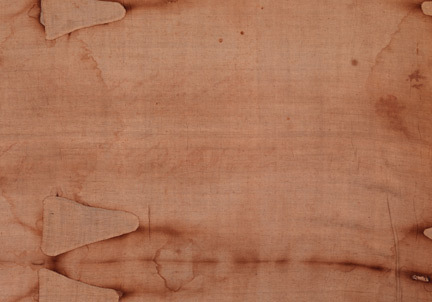 Photographing three parts instead of one (the whole Shroud at one time), increased the resolution of each part that resulted in much higher quality images of the Shroud. 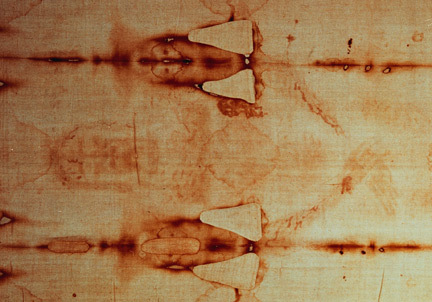 In group b, Full Image, there is an example of three matched parts (mosaic) that have been cut and are being assembled to create a full image of the Shroud. 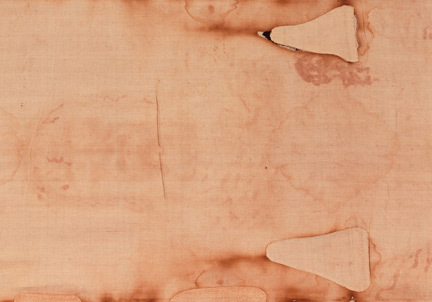 In contrast to the High Contrast Contacts of the 8 x 10 black and white films in section two, all of these color transparencies are direct photographs of the Shroud. They all have notches. This section of groups c, d, and e contains beautiful high resolution examples of these 8 x 10 color transparencies even though they are not matched photos. 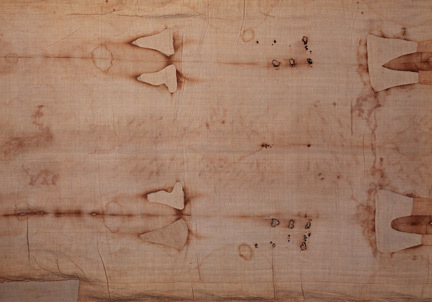 Most important, some allow the observer to see the Shroud image and blood marks as it is (see note on image 129 in section 5C). Other photographs are taken using different exposure times, etc. 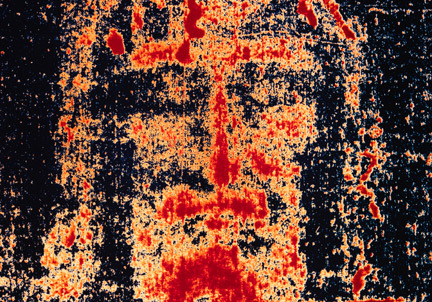 to enhance the visibility of the image of the Man of the Shroud. Vernon took these photos using a camera with an 8 x 10 backing loaned to him from the National Geographic Magazine. Some of these photographs were later seen in an article published by that magazine. Later he used transparencies such as these to create many black and white 8 x 10 High Contrast Contacts seen in section two, Black and White Films 8 x 10.